What do you mean by Permutation? What is circular permutation and how it is different from linear permutation? The word permutation means arrangement of the alike or different objects taken some or all at a time. So we can observe the word ‘arrangement’ used in the definition of permutation. Here the arrangement means selection as well as ordering. That means the order in which the objects are selected have also been taken care of in this case. The number of 5 digit numbers which can be formed using the digits 0, 1, 2, 3, 4 and 5. In this example, we just not have to select the 5 digits out of given 6 digits but also have to see the number of possible cases for the different arrangement. So, the numbers 34251, 21034, 42351 are all different cases. We will try to explore this definition in the upcoming heading. 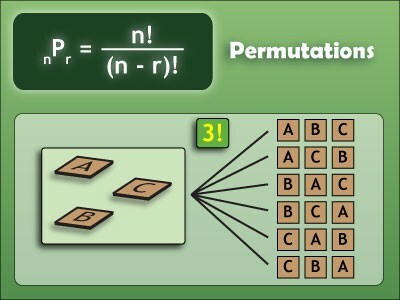 Permutation refers to the situation where the arrangement of objects are being considered. This can also be represented as P(n, r) or  Prn. Here, in the definition of permutation, r can be any positive integer less then or equals to n. So, on the basis of the values of r whether it is less then or equals to n we can have two different conditions or theorems. Consider the 5 seats in a car on which 5 persons are to be seated. So, to find the number of cases in which 5 persons can be seated will be the case of permutation of 5 persons taking all 5 seats at a time (5P5). Consider the 10 chairs in a room for which 15 persons are supposed to be seated. In this case, here we have 15 persons to be arranged but only on 10 chairs. So, this can be calculated by 15P10. One more thing which we can learn by observing the above example is that, we first need to choose or select 10 out of 15 persons which can be arranged on 10 available chairs. So, every problem on permutation is broken down into selection and then arrangement. The permutations of the numbers 1, 2 and 3 will be – 123, 132, 213, 231, 312, 321. All these 6 permutations (that is, 3!) are different and thus are distinguishable permutations. When we are given certain set of objects or items, in which some of them are identical of the same kind and these identical groups may be of two or more items, in this case the number of permutations actually reduces. This concept of distinguishable permutation is also explained in the previous heading. Let us break this problem into two different cases. Case – I: Permutation of alike objects taken all at a time. This case is same as that which is explained under the subheading – ‘Distinguishable Permutations’. There it was assumed that the permutations of all the given objects is to be done. So, let’s directly take an example to understand this case. How many different words can be formed with the letters of the word ‘PATALIPUTRA’. 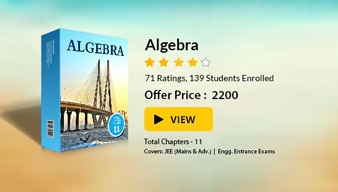 In the given word, we have two P’s, three A’s, two T’s, one L, one I, one U and one R.
One example, which you may try on this case – How many 8 digit numbers can be formed using two 1’s, two 2’s, two 3’s, one 4 and one 5. One more example of alike permutation is shown in the figure. Case – II: Permutation of alike objects taken few at a time. In this case, where we are supposed to permutate few objects from the given number of objects, we actually need to form different cases depending upon the given problem. In every problem of this case, we first go for selection and then arrangement. Below is the example to understand this case. Here, we have – four E’s, three E’s, two D’s, one P, one I and one C.
Thus, add all the results of different cases at the end to get the final answer. Till now, we have discussed only about linear permutation in which we arrange the given objects into a single row. In case of circular permutation, the objects will be arranged in the circular fashion i.e. they won’t have starting or end point. For the circular permutation, one just fix the place of any one of the object and arrange the others same as that of linear permutation. This technique effectively will give us the number of circular permutations. Now the reason, why we are fixing the place of one and then arranging the others in linear permutation can be understood very comfortable by an example in the below figure. In the figure, two different circular arrangement (1 and 2) are shown. The relative positions of A, B and C are exactly same in two respective arrangements. And thus, we can consider, all the arrangements shown in either 1 or 2 are same but arrangement in 1 is different from arrangement 2. So, finally we only have 2 different arrangement. Thus, to solve this problem of repetition, we first fix the position of any one. 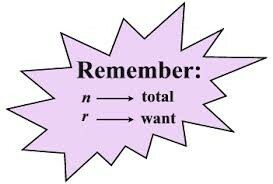 In general, the number of circular permutation of n distinct objects (when objects are different) is (n-1)!. But note that, in this definition, we are assuming the clockwise order and anti-clock wise order as different permutation. While, if anti-clockwise and clock wise are considered to be same, then the total number of permutation will be half of that of the previous case. that is, This happens in the case of flowers or garland beds in a neckless. Note – If we have n different things off which only 4 things has to be arranged in the circular order, then the number of arrangements will be = nCr  x  (r-1)! 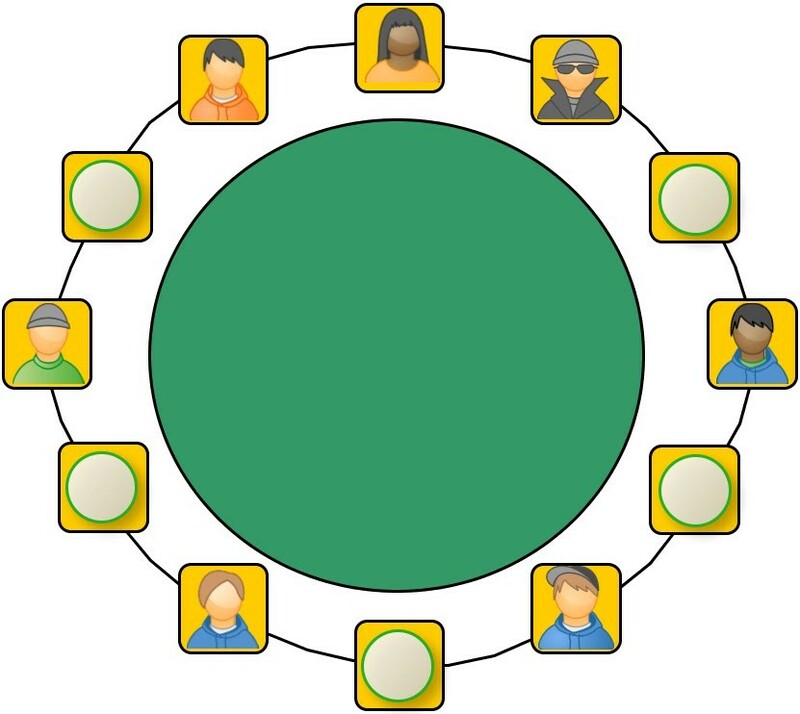 Find the number of ways in which 12 people can be seated on a round table so that all shall not have the same neighbors in any two arrangements. For this case, anti-clock wise and clock wise arrangements will be considered as same.